Swede Joakim Lagergren birdied the final hole to win the Northern Ireland Open by one shot and secure his first European Challenge Tour title. Lagergren saw his six-shot overnight lead evaporate but the 22-year-old steadied himself to post a 72 and end 13 under, one ahead of Adrien Bernadet. Jerome Lando Casanova shot 65, the best round of the day at Galgorm Castle, to share third with Bernd Ritthammer. Gareth Shaw and Jonathan Caldwell were best of the NI players on six under. Lurgan man Shaw and Caldwell, from Clandeboye, posted closing rounds of 70 and 71 respectively to join a group of players in a tie for 12th position. Stockholm native Lagergren made a nervous start with bogeys at the first and third holes but posted three birdies during the remainder of his round, with just two further blemishes to his card. His winning birdie at the par-five last came after a deft pitch to eight feet from a difficult greenside lie. "Under the circumstances the pitch at the 18th was my best shot of the week," said Lagergren, who was presented with the trophy by Arlene Foster, Minister for Enterprise, Trade and Investment. "I couldn't he happier than I am right now. I was nervous all day and am delighted to have won." 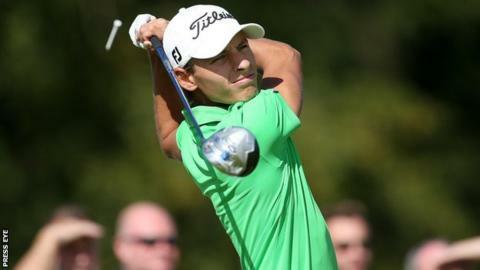 Northern Ireland Open champion Joakim Lagergren admits to feeling 'stressed' as he saw his six-shot overnight lead evaporate at Galgorm Castle. The world number 957, who picked up a cheque for just over £21,500 for his win, had registered a course-record 62 in his first round on Thursday. Frenchman Bernadet emerged as his main challenger thanks to five birdies on his front nine, but nine pars on his second nine saw him fire a 66 to fall just short of Lagergren's final total. Casanova and Ritthammer finished 11 under, with former European Tour winner Kenneth Ferrie one of four players to tie for fourth on 10 under. Dutchman Maarten Lafeber ended four under following a 69, one ahead of Swede and three-time European Tour winner Johan Edfors, who carded the same score. Former British amateur champion Alan Dunbar recorded an impressive 67 to finish equal 44th on level par and another Northern Ireland player, John Ross Galbraith, was the leading amateur on three over thanks to a 70. A second successive 74 saw Ballymena amateur Dermot McElroy take joint 60th on four over. Lagergren's previous best Challenge Tour finish this year had been a share of 19th at the St Omer event in France in June, although he did make the cut at last week's Czech Masters on the main tour when he eventually finished 81st after disappointing closing rounds of 76 and 79. The Swede finished 86th in the Challenge Tour rankings in 2011 but played mostly on the main tour in 2012 and 2013 as he achieved 140th and 144th positions in the Race to Dubai. His best career-finish on the Challenge Tour had been a sixth place at the 2011 Norwegian Challenge. With over 13,000 spectators attending the event on Sunday, that brought the overall figure up to 34,481 for the week which comfortably exceeded the existing European Challenge Tour records. The Challenge Tour event will be played again at the Ballymena venue next year and its future appears secure for some time to come.